John Travers, whose father, John, was a shoemaker in the English village of Windsor, Berkshire, was born there in 1703. He received his musical training as a chorister at St George’s Chapel Windsor, bringing him an early connection with the Royal Household which he was to maintain for most of his career. 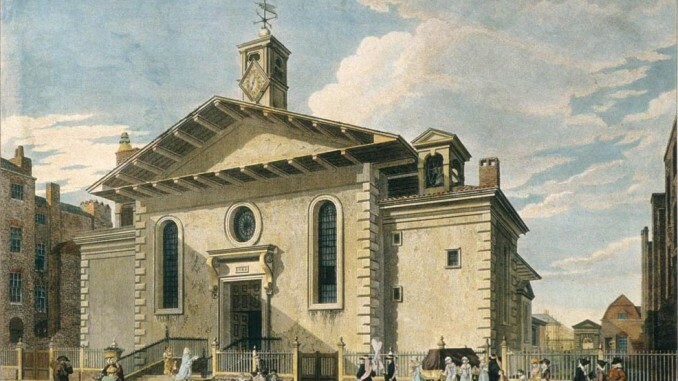 In 1719, on the 14th of March, 1719, when he was aged around 15 or 16, he was apprenticed to the 23-year-old organist and composer, Maurice Greene (1696 – 1755), who had just been elected organist of St Andrew’s Church, Holborn, and later the same year was to become organist of St Paul’s Cathedral in succession to Richard Brind. Like many of the up and coming organist composers of the period (such as John Keeble), Travers studied musical theory and composition with Johann Christophe Pepusch (1667 – 1752), which involved having a good understanding of ancient Greek music theory and the tetrachord. The music historian Charles Burney (1726 – 1814) reported that Travers copied the musical style of Pepusch in his compositions. When he died, Pepusch left part of his music library to Travers. Around 1725, when he was aged 22, John Travers became organist of St Paul’s Church, Covent Garden, known as the Actors’ Church. In 1727, Maurice Greene, who had just been appointed composer at the Chapel Royal, appointed Travers as his sub-organist at St Paul’s Cathedral. He also appears at some stage to have been organist at Fulham Parish Church. In 1737, Travers joined Greene at the Chapel Royal, having been appointed organist in succession to Jonathan Martin. He was to remain there for the rest of his life. In July the same year, he took on as apprentice Thomas Barrow (died 1789), son of John Barrow, of the parish of St Martin-in-the-Fields. Barrow became a noted countertenor and composer and they remained firm friends. Barrow gave Travers a set of etchings of paintings by Rubens, framed and glazed. When Travers died, he returned them in his will to Barrow. Although no longer the organist, John Travers appears to have continued living in Covent Garden for the rest of his life. In 1749 he is recorded as living in King Street, and he was still there in 1755 when he signed his will. In 1738 he was one of the founding members of the Society of Musicians (later the Royal Society of Musician) which had been brought into being by the composer Michael Festing and Travers’ old friend Maurice Greene. Pepusch was also a founding member. The society was a charity which relieved poverty of the families of deceased musicians. Travers is known to have composed a number of anthems including “Ascribe Unto the Lord” and “Ponder My Words”, together with a number of psalm chants and hymn tunes. He also wrote at least 12 organ voluntaries which were published as a collection some years after his death. In his will, he also left all his manuscript compositions to Thomas Barrow, as well as the collection of music by other composers that Barrow had copied out for him. John Travers died sometime around May 1758 and his will was proved 8th June by his executrix, a spinster called Elizabeth Yates to who he left all his estate (after the bequests to Thomas Barrow) and who was described in the document as living with him at the time he signed it. The publication in 1769 of 12 of his organ voluntaries was most likely organised by Thomas Barrow.